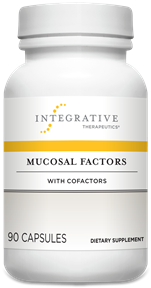 Mucosal Factors with Cofactors is a well-tolerated multi-probiotic formula that provides both beneficial intestinal bacteria and growth factors known to promote recolonization. Fructooligosaccharides (FOS) act as a food source to stimulate the growth of beneficial microflora (and probiotics) in the intestines. Research has demonstrated that use of a probiotic and prebiotic blend can quickly restore and help maintain a healthy balance in the beneficial gut microflora reservoir. Another ingredient in the formula, turmeric, has been investigated for its support of healthy bile secretion, and pancreatic and gastric function. It possesses excellent stability at room temperature. Contains No sugar, yeast, wheat, gluten, corn, soy, artificial coloring, artificial flavoring or preservatives. This product contains natural ingredients; color variations are normal.